Members enjoyed a tour of “The Life and Legacy of Thomas More” exhibit on Wednesday, November 2, 2016 from 6:30 – 8:30 p.m. at the St. John Paul II National Shrine in Washington, DC. The Saint John Paul II National Shrine honors the life and legacy of Thomas More with a special exhibit and events, the first of which is taking place on Saturday, September 17. 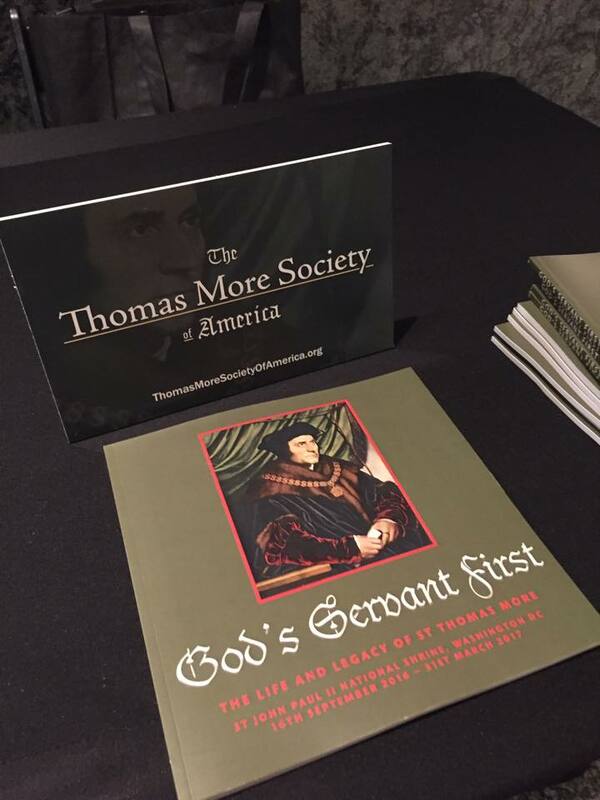 Over 60 relics and artifacts bring to life the courageous witness of a great man in a special exhibit, God’s Servant First: The Life and Legacy of Thomas More. This original exhibition features treasures from the Stonyhurst College Collections in England and is available to view only at the Saint John Paul II National Shrine. Some of the featured items include the following: a hat used by St. Thomas More; a religious garment embroidered by Katherine of Aragon, the first wife of King Henry VIII; a monumental woodblock print by the German artist Albrecht Dürer; a first folio by William Shakespeare; the pectoral cross and saddle chalice that belonged to John Carroll, the first Catholic bishop in the United States; and first-class relics of Saints Thomas More and John Fisher. The exhibit will be open daily from September 16, 2016 until March 31, 2017. Janet Graffius is Curator of Collections at Stonyhurst College. She has worked with the collections there since 2001 and previously worked in a number of museums in the United Kingdom. She has published extensively, including works on English Catholic Vestments, Jacobite Artifacts and Relics, Shakespeare and Jesuit Drama, and Two Thousand Years of Sacred Culture in the Stonyhurst Collections. Her broadcast work includes a number of programs for BBC Radio and Television and EWTN. Read more about the exhibit and the National Shrine by clicking here.